President Trump touched down in Duluth Wednesday for a whirlwind three-hour appearance that included an economic roundtable and a campaign rally in front of more than 8,000 Minnesotans. During his brief stint in the state, Trump covered a lot of ground, telling crowds he has created millions of jobs, lowered unemployment to its lowest levels in the nation's history and brought the dying steel industry back to life with his recent tariffs. He also took a few digs at Democrats on immigration, accusing them of favoring open borders to Mexico. 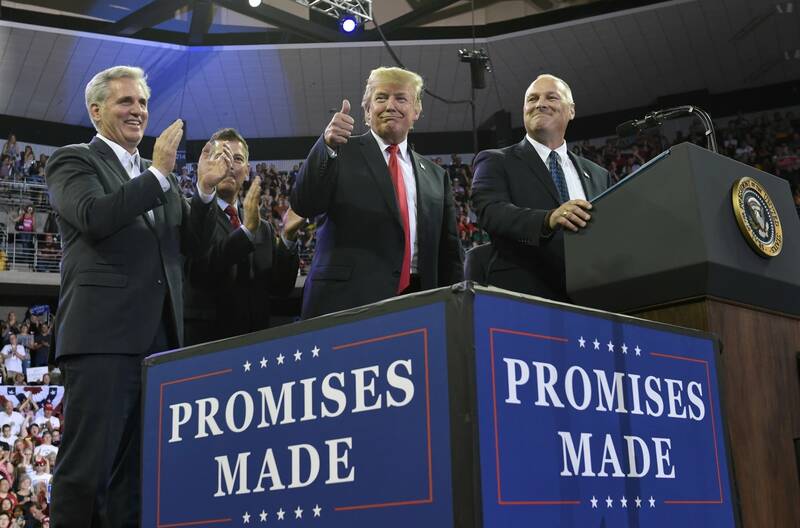 His comments were met with cheers from his supporters in the Amsoil Arena, but as is common with the first-term president, not all of his statements were completely accurate. Here are a handful of things Trump said during his visit to Minnesota — and how they hold up to the facts. What he said: "We came this close to winning the state of Minnesota ... it's been many, many decades since a Republican did that. I thought I was going to do it. I needed one more visit, one more speech." The facts: His statement that it's been "many, many" decades since a Republican won Minnesota is correct. Minnesota has voted for a Democratic presidential candidate every cycle since Richard Nixon's landslide victory in 1972, and usually by large margins. In 2016, Trump came close to beating Democratic nominee Hillary Clinton, earning 44.92 percent of the vote to her 46.44 percent. That was a spread of just 44,765 votes out of more than 2.7 million votes cast. That was the closest any Republican had come to beating the Democrat in Minnesota in years, but it wasn't the closest ever. In 1984, Minnesota's own Walter Mondale won Minnesota with 49.72 percent of the vote, but Ronald Reagan was close behind, earning 49.52 percent of the vote. That was a spread of just 3,761 votes out of 2 million cast. What he said: "I've had the head of U.S. Steel call me the other day and he said, 'We're opening up six major facilities and expanding facilities that have never been expanded. They haven't been open in many, many years. The steel industry is doing unbelievably well very, very quickly. Quicker than I even thought.'" The facts: Trump's not wrong. Steel facilities have opened up in a number of states this year after he announced in March that he was imposing 25 percent tariffs on all imported steel and 10 percent tariffs on aluminum. And things are certainly looking up for Minnesota's taconite mines, which help feed the steel industry. But things have been turning around in Minnesota longer than Trump has been president. Mining employment in Minnesota's northeastern arrowhead region hit a low in 2016 — at roughly 3,600 jobs — after several facilities closed down, according to the Minnesota Department of Employment and Economic Development. It rebounded to roughly 4,000 jobs in 2017, but that growth actually started during the last months of Barack Obama's administration. We don't know whether U.S. Steel is looking at an expansion at one of its two Minnesota taconite operations, but all of the state's legacy taconite mines were back online prior to the tariff announcement. What he said: "Have you been watching what's been going on with the inspector general's report, what a scam this whole this is? How guilty is [Hillary Clinton]? ... No matter how many crimes she committed, which were numerous, they wanted her to be innocent, with me, nothing, no collusion, no nothing." The facts: Last week, the Department of Justice released the long-awaited, 500-page report into Hillary Clinton's use of a private server while she was secretary of state. But in testimony before Congress this week, Inspector General Michael Horowitz told lawmakers that his report was narrowly focused on Clinton's email practices and it was not his role to dig into the separate probe into whether the Trump campaign colluded with Russia during the election. Meaning, the report didn't even look into the issue of collusion, so it couldn't have cleared Trump of collusion. What he said: "Unemployment numbers are among the best in the history of our country; African-American unemployment is at its lowest level in the history of our country." The facts: In the nation, unemployment edged down to 3.8 percent in May, according to the U.S. Bureau of Labor Statistics (BLS). That's the lowest rate since April of 2000, when unemployment was at 3.9 percent, but it's not the lowest level in "the history of our country." Since the BLS started recording unemployment rates in 1929, the yearly rate has fallen to or below 3.8 percent 10 times. Trump is right, however, on unemployment rates for black Americans. In June, black unemployment fell below 6 percent for the first time since the 1970s, when the BLS started breaking the numbers down by race. What he said: "For the first time in 20 years, wages are rising." The facts: It's true that wages have risen under Trump, a total of 1.1 percent during his first 11 months in office. But his claim that they haven't gone up in 20 years is not true. Wages hit a low point after the Great Recession in the second quarter of 2014, but then started to go up for the rest of the Obama administration, rising a total of 4.1 percent. What he said: "We've created 3.4 million new jobs since Election Day." The facts: That's true. In May of 2018, there were 155,474,000 people employed in the nation, according to the Bureau of Labor Statistics. That is up 3.93 million jobs from January of 2017, when 152,081,000 million Americans were employed. What he said: "Democrats don't care about the impact of uncontrolled migration on your communities, your schools, your hospitals, your jobs or your safety. Democrats put illegal immigrants before they put American citizens. What the hell is going on?" The facts: John Keller, executive director of the Immigrant Law Center of Minnesota, said the last time Democrats had a chance to vote "and lead on immigration reform," they voted for a massive increase of enforcement at the border. "It was packaged with a path to citizenship for as maybe as many as 10 million people," he said. "But to say that they are somehow only interested in open borders or favor illegal immigrants or undocumented immigrants over citizens is simply not true."